Technology being developed by a team of military doctors and scientists to stop rapid blood loss on the battlefield is a step closer to saving lives. The TXA Autoinjector project, which allows life-saving blood clotting treatment to be administered at the push of a button, has been given a £5 million funding boost by Defence Secretary Gavin Williamson to accelerate the technology. 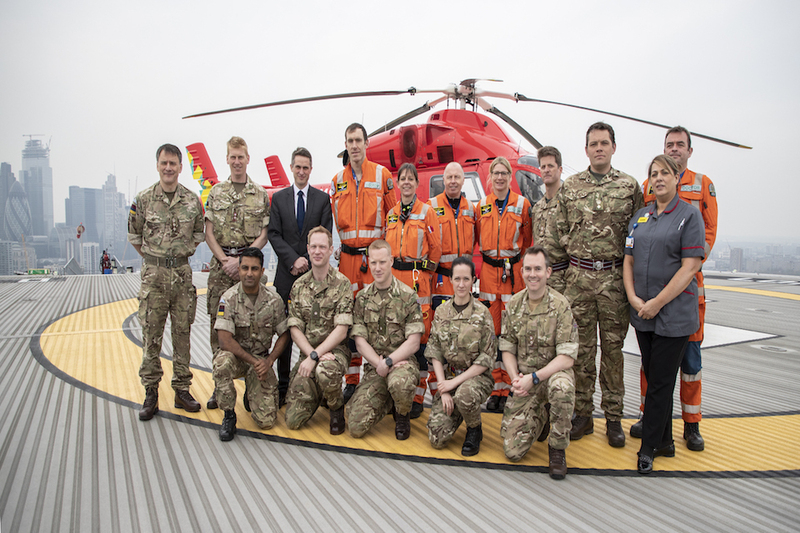 During a visit to The Royal London Hospital and London’s Air Ambulance at Barts Health NHS Trust today, the Defence Secretary said the technology would be backed by the department’s new Transformation Fund. Saving lives is at the heart of what our Armed Forces do, and this funding shows our commitment to ensuring those serving on the frontline get the best treatment as rapidly as possible. Our work to save lives does not stop at our serving men and women but must also be about helping to improve the livelihoods of people across the world. This technology will allow us to just that, whether it is rolling it out to emergency services in the UK, or equipping medics in developing countries across the globe. If successful, the cutting-edge medical technology could also be adapted from use in the battlefield to any major trauma incidents, from stab wounds to road traffic accidents. It could also be used to help women in developing countries who suffer major blood loss during birth and are unable to access medical treatment. Around 4.8 million people across the globe die due to major trauma incidents every year, while 14 million women face traumatic blood loss during labour. Large international clinical trials show that TXA saves lives in bleeding patients. But we also know that for patients to be given the best chance, TXA should be given as soon as possible after injury. The auto-injector uses Tranexamic Acid, which is a cost-effective and reliable drug that stabilizes and strengthens blood clotting within damaged tissues and can be administered by an untrained user. Currently, administration of TXA requires an intravenous drip but the development of the auto-injector will allow it to be administered safely into a muscle. The treatment is expected to benefit up to a third of seriously injured soldiers who would otherwise die from their wounds. Once developed, the Autoinjector could be rolled out to police, NGOs, ambulance services, and Code Red first aid kits situated in public places.